The Dr. Kremer line of fine therapeutic products is a special formula for alleviating skin ailments. Many people who suffer from skin ailments such as psoriasis can find comfort and support in Dr. Kremer's products. Each item is made up of black mud and mineral extracts from the Dead Sea that are rich in vitamins A, B, E and oligo elements. Skin care cream for all skin types and skin problems.Clinically certified dermatological action. 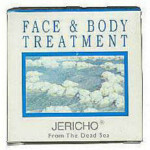 JERICHO Bath Salts LTD, manufactures natural Dead Sea cosmetics. The company's managing director and owner, is Mr.Eli Segev. He and his wife are sole company shareholders. The Dead Sea, the lowest point on earth, has one of the richest natural deposits of rare and pure minerals, whose amazing rejuvenating properties are well known around the globe. It has been known throughout history, that the special black-mud found on the shores of the Dead Sea mixed with local herbs and vegetation create an amazing array of products, which both beautify and rejuvenate the body. People the world over flock in their masses to the Dead Sea resorts for pampering and massages, using the Dead Sea products, whose rejuvenating effects and its restoring properties are legendary! The biblical Queen of Sheba and the beautiful Queen Cleopatra are reputed to have known about the beneficial effects of the Dead Sea. JERICHO Dead Sea products are based on those unique minerals and on extracts of plants from the shores of the Dead Sea. Jericho B.S.L has a large range of goods, ranging from the famous Black Mud to facial cleansers & soaps.